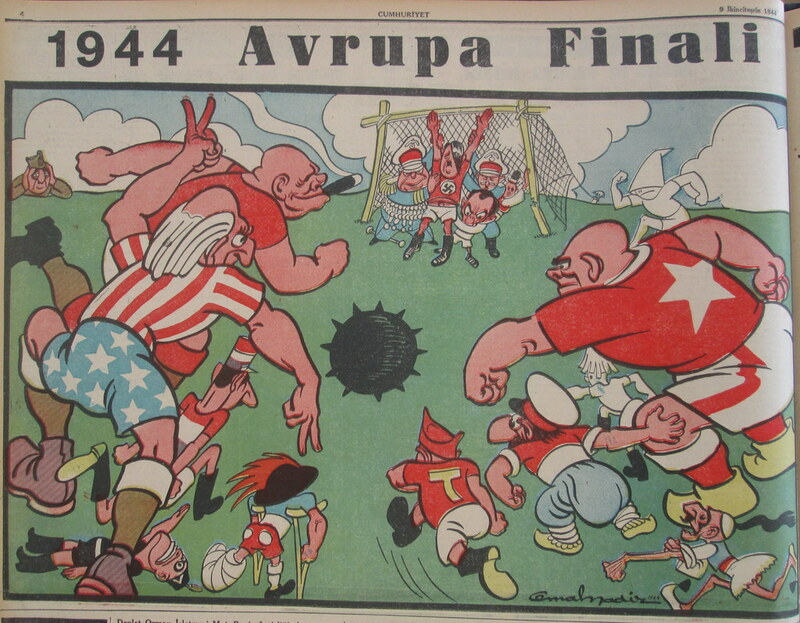 With Cumhuriyet's cartoonists back in the news over the past few weeks, we wanted to finally publish an amazing collection of the paper's cartoons that provide a remarkable narrative of the the final years of World War Two. 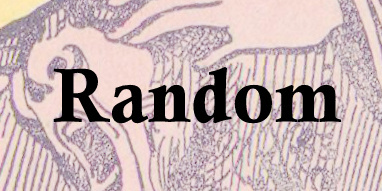 These have been compiled and presented by Irina Levin, Afternoon Map's guest editor and so much more. 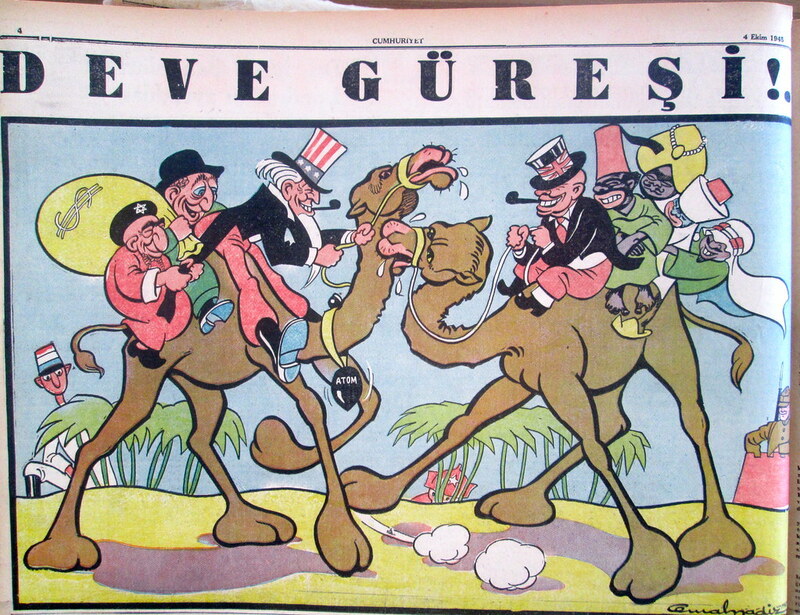 As anyone who read our piece on Arabs through Turkish eyes knows, the 1940s and 50s was an amazing era for visually-compelling, if often ideologically problematic, cartoons. 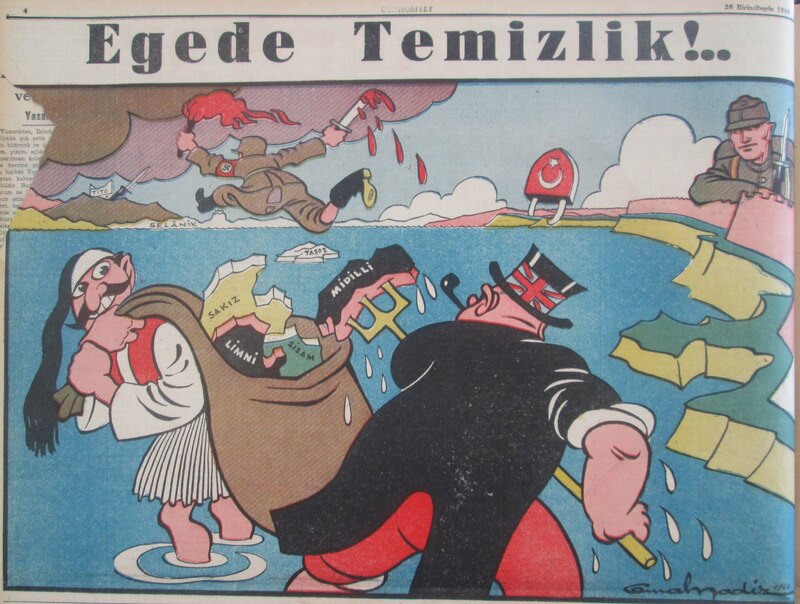 Today, courtesy of Irina, we have a remarkable series on World War Two as seen through the cartoons of Cemal Nadir, one of Turkey's most famous illustrators (he has streets named after him in Ankara and Bursa!). 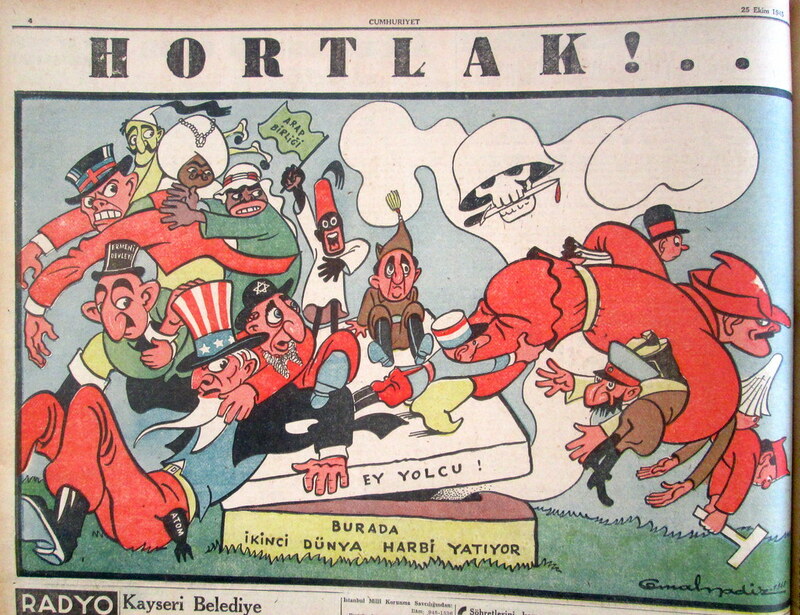 These cartoons all appeared in Cumhuriyet. 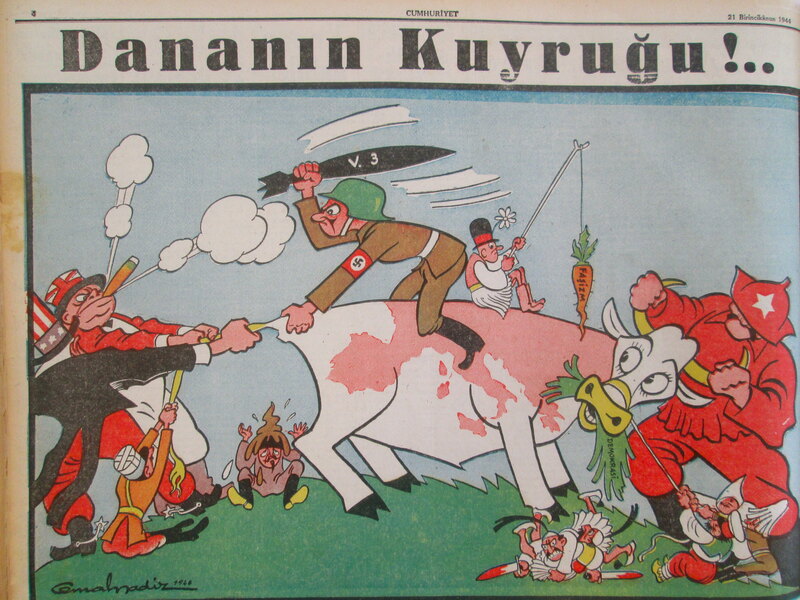 While the paper's editor, Yunus Nadi, received justifiable criticism for his pro-German sympathies during the war, Nadir's cartoons are relatively well-disposed to the Allies, particularly during this period when the war's outcome had become increasingly clear. 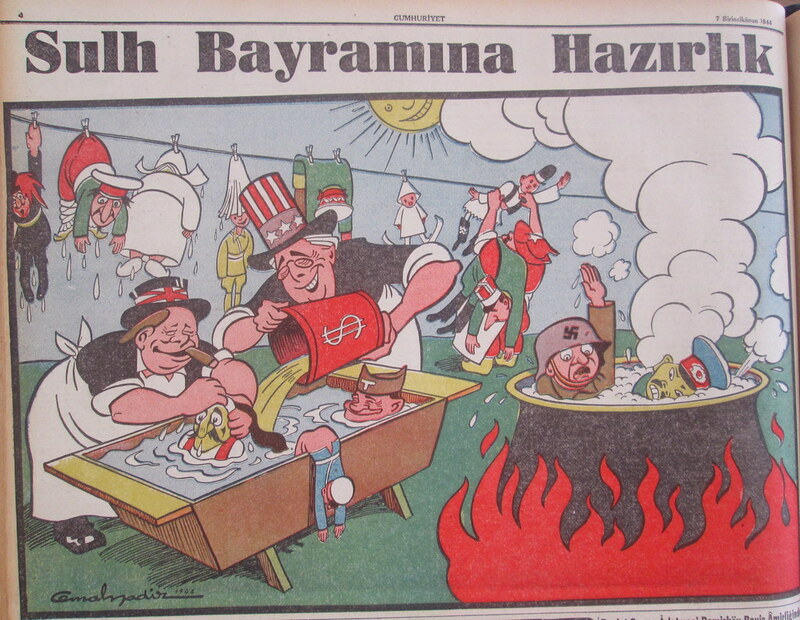 It is also worth noting how the cartoonist positions Turkey, whose avowed neutrality had frequently been challenged during the course of the conflict. 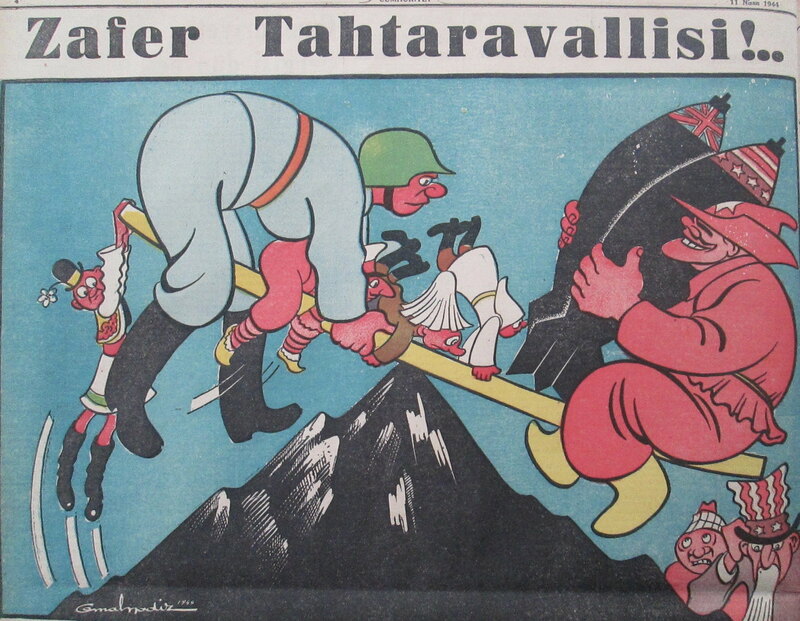 While Soviet Russia (always portly, always in red), England (Churchill, with obligatory cigar), the United States (Uncle Sam or Roosevelt), Germany (Hitler or German soldier), Japan (usually Tojo, in disturbing greenish yellow), and a colorful cast of Europeans (Tito, with a helpful "T" on his face, is easiest to spot!) dominate center stage, Turkey, when it comes in at all, is portrayed as a strong and well-meaning, if minor, player. 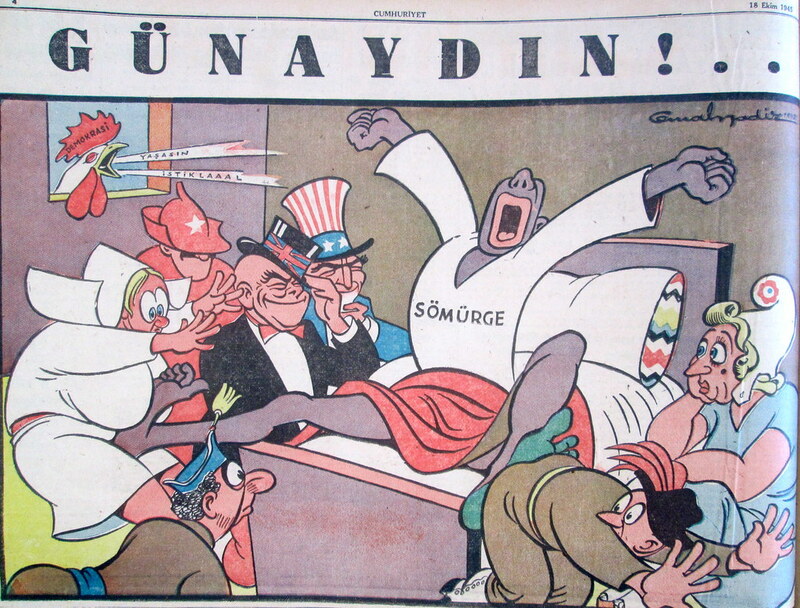 For instance, in the cartoon entitled "Ümid Dünyası," the Turkish soldier or mehmetcik is pictured dreaming of "domestic and world peace," while the other countries' representatives display more self-serving geopolitical ambitions. 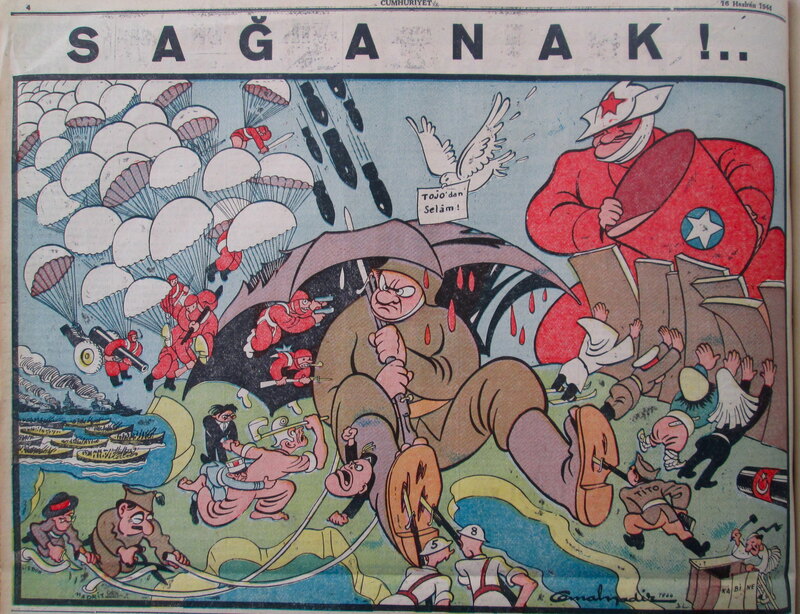 In "Sağanak," in which the German soldier is under all-out attack by the Allies, Turkey is represented by a tiny cannon, poised but not actually firing, in the lower right-hand corner. 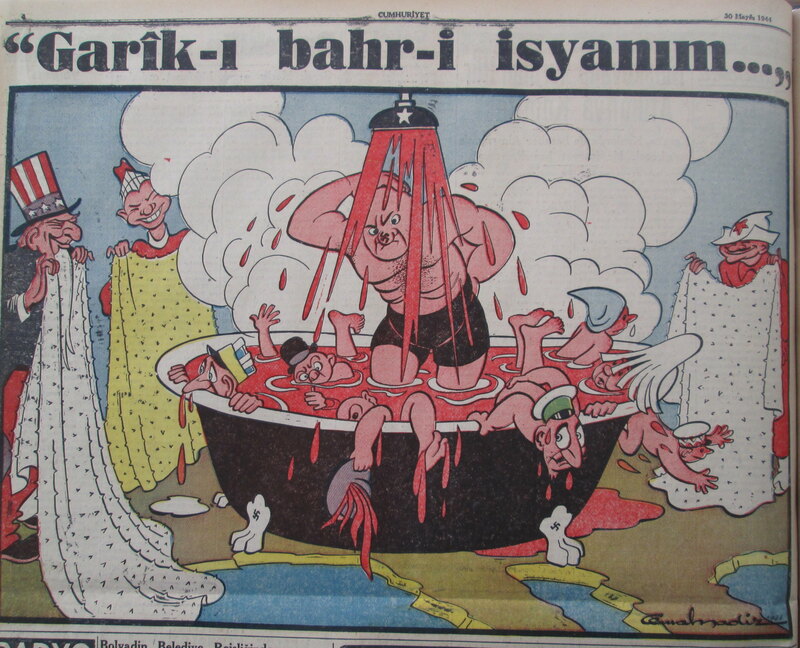 Nadir's series of cartoons chronicling the war appeared on the back page of Cumhuriyet once a week. 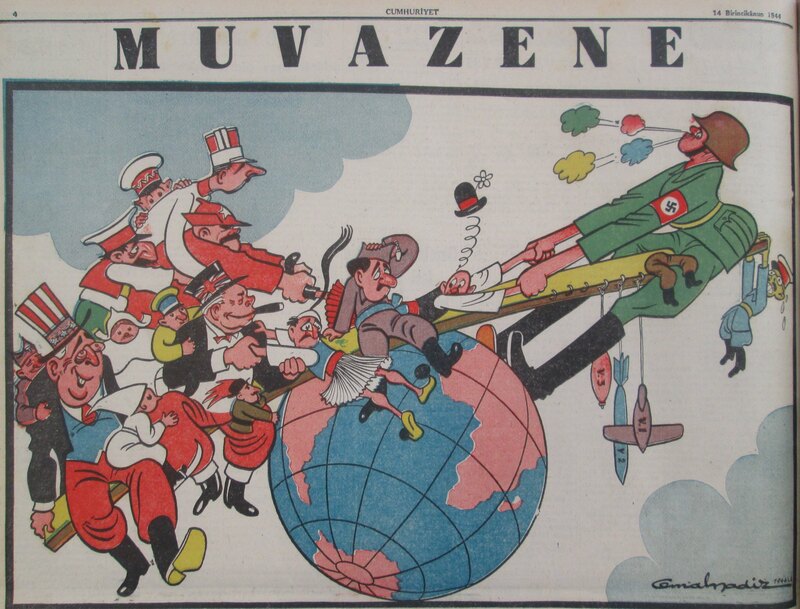 Those featured here are highlights from 1944 and 1945, showing Germany's increasingly desperate position and growing US-Russian rivalry, as well as the challenges of decolonization and planning for a post-war world. 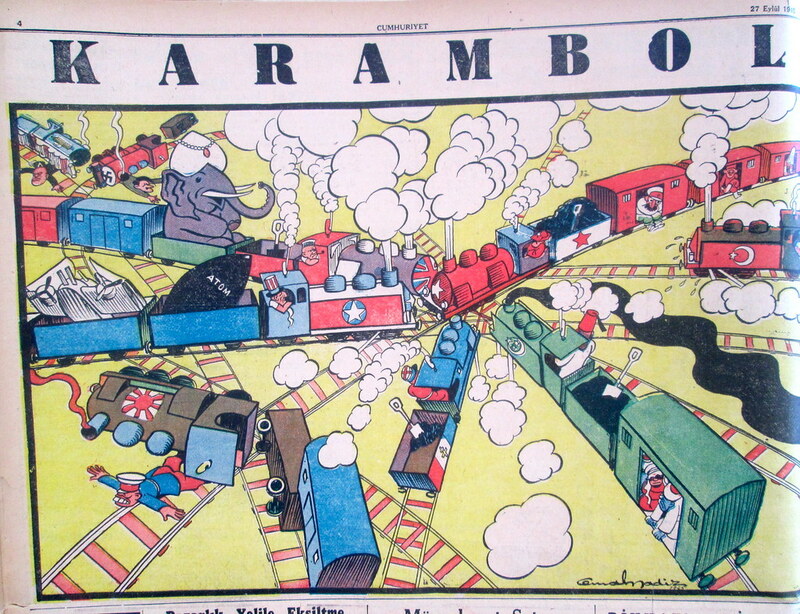 We've provided translations for the captions (as well as some speculation about the minor characters in weird hats) but the beauty of these cartoons is that they speak for themselves. 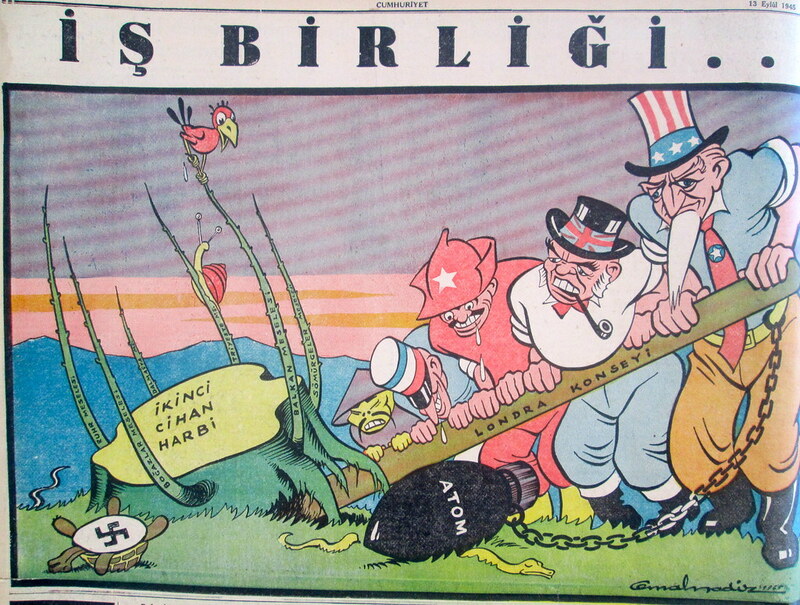 Cooperation: The Stump says "Second World War" and the shoots growing out of it have labels like "Straits Issue, Balkan Issue." 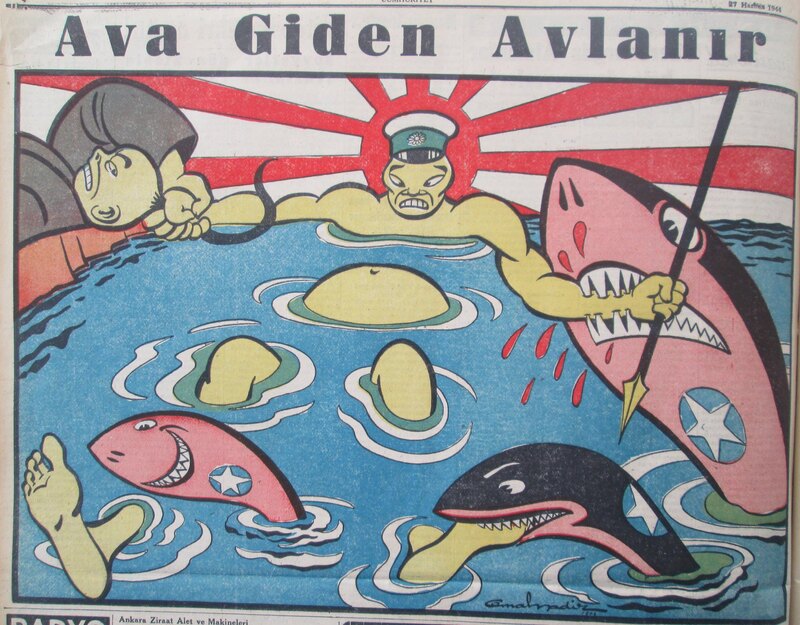 Irina adds: "Turtles are never Nazis!" 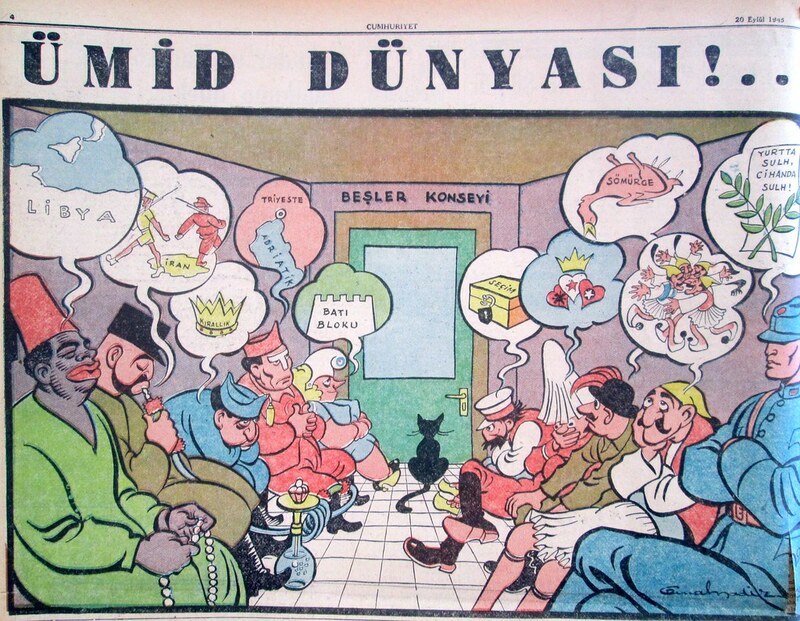 The World of Hope (Outside a door labelled "Counsel of the Five") Turkey, far right, wants global and domestic peace, Italy wants a dead bird labelled "colonies"and France wants a strong "Western Block." 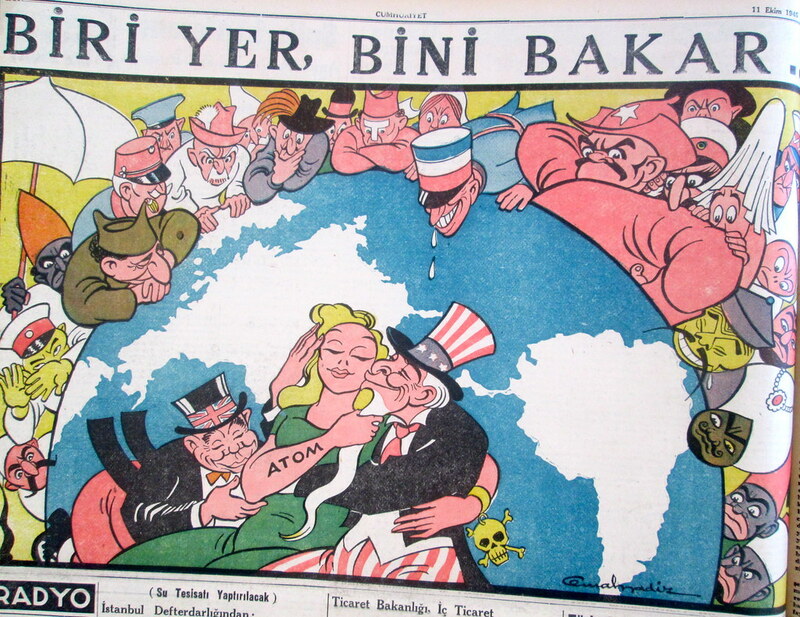 The Libyans want Libya, Tito wants Trieste, Iran wants the British and Russians to leave and Greece just wants a loving brotherly reunion instead of civil war. Good Morning. 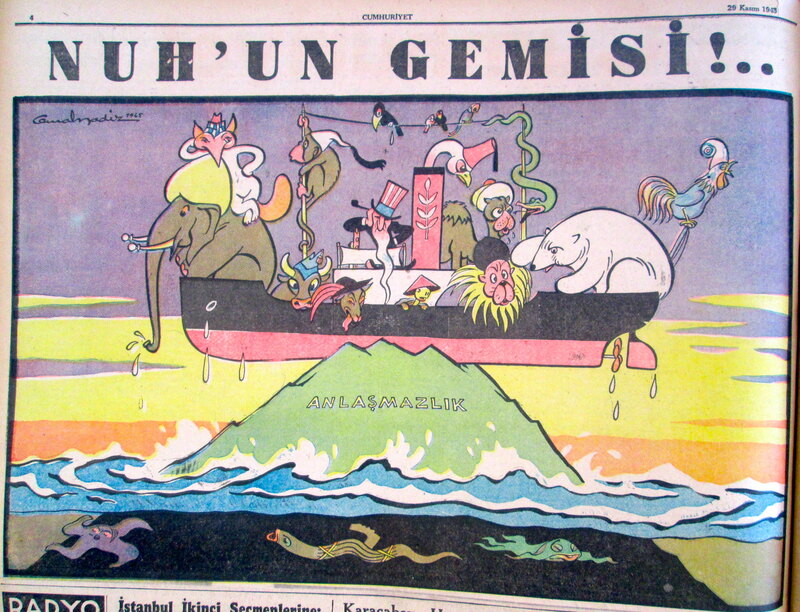 The man awaking is labelled "Colony" and the Rooster, labelled "Democracy" is crowing "long live independence"
Noah's Ark. The mountain is labelled "disagreement." After everything that happened, this actually seems like a surprisingly optimistic note to end our series on. At least we're all in the same boat?